In 1989, Dr. Calvin Lee was accepted to Harvard and Stanford Universities, but he decided to go to Brown University. Dr. Calvin Lee and Dr. Tammy Wu are graduates of Brown University Medical School in 1997. Dr. Tammy Wu graduated top of her medical school class. They experienced expert surgery residency training at Case Western Reserve and Southern Illinois Universities. In 2002, Dr. Calvin Lee was offered surgical jobs in San Diego and Los Angeles, but he decided to go to Modesto. There, he worked as a General / Trauma Surgeon with the McHenry Medical Group (now called First Choice Physicians). Dr. Tammy Wu was offered a position in an international MicroSurgery fellowship, but decided to join Dr. Calvin Lee in Modesto, accepting a Plastic Surgery position with Sutter Gould. Together, they formed Surgical Artistry in 2006. Botox, Juvederm, Voluma, Belotero injections – my goal is to provide cosmetic injections at the highest level. I value quality surgical level outcomes, patient safety, comfort & communication. I am a Board Certified General Surgeon with a past trauma career who assists in plastic surgeries and spinal cord stimulator / spinal pain pump surgeries. I am also an Acupuncturist who injects Botox as an extension of Acupuncture. Many of my Botox point selections are related Acupuncture points for migraine headaches and wrinkle prevention. 40% of my clinical time is spent at work is spent on Acupuncture, and 50% of my time is spent with cosmetic injections for Botox, Fillers, and Veins, and 10% of my time is spent assisting in surgeries. In a clinic day, it is common for me to use 200 units of Botox, 4 syringes of dermal fillers, and see about 6 acupuncture patients. Outside of my clinical time, I also spend a great deal of time as an administrator of Surgical Artistry – the combined medical office for myself and my wife, Dr. Tammy Wu, Board Certified Plastic Surgeon. We have been surgeons in Modesto since 2003. My wife and I met while we were students at Brown University. I am an author for MedicalSpaMD a resource for plastic surgeons, dermatologists, and aesthetic physicians. I’m also a member of the marketing department of the Cooperative of American Physicians based in Los Angeles. My hobbies include piano, violin, marathon running, being vegan, creating websites and social media. Wonder if your Plastic Surgeon is Board Certified in Plastic Surgery? Dr. Tzuying Tammy Wu, MD in Modesto, California is a Board Certified Plastic Surgeon. Her Plastic Surgery Board Certification results can be seen here on our Modesto web page. Read about Board Certification in detail here. Board Certification is a voluntary process, and one that is very different from medical licensure. Obtaining a medical license sets the minimum competency requirements to diagnose and treat patients, it is not specialty specific. Board Certification demonstrates a physician’s exceptional expertise in a particular specialty and/or subspecialty of medical practice. Is Dr. Tammy Wu Board Certified in Plastic Surgery? 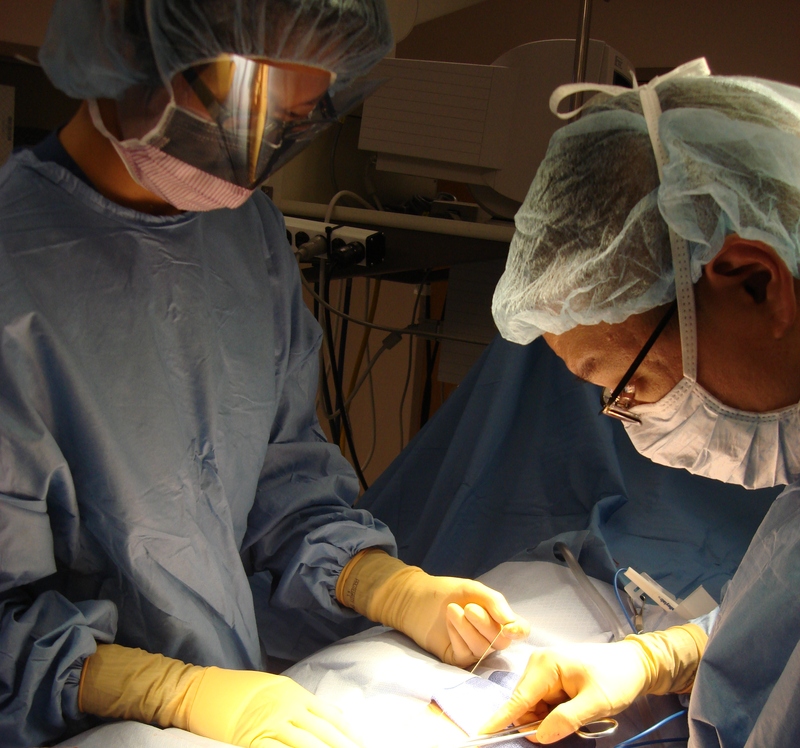 Dr. Wu and Dr. Lee operating together in Modesto, California. Modesto Plastic Surgery Dr. Tammy Wu is Board Certified in Plastic Surgery. She was initially certified in plastic surgery in 2005 and has since been recertified – with her certification good till the end of 2025. The recertification process occurs every 10 years. This info is current as of the writing of this web page on 1/29/15. 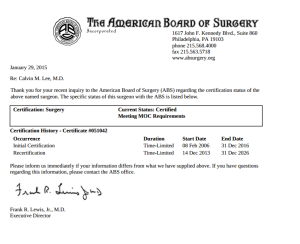 How to look this Board Certification information up on the internet regarding Plastic Surgery? At our Modesto Plastic Surgery office: Surgical Artistry, we have received this question on the phone a few times. We were initially surprised that patients would be confused on the internet. The we realized that they were not searching for Dr. T. Tammy Wu via her first name which is “Tzuying.” “Tammy” is her middle name. 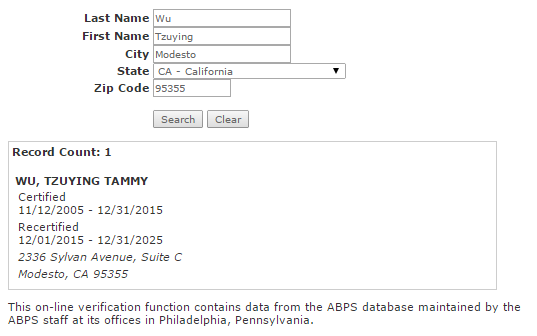 Thus when entering the search, use Dr. Tzuying Wu. Then you’ll find the results you are looking for. As an aside, Dr. Calvin Lee, her husband, is board certified in surgery. 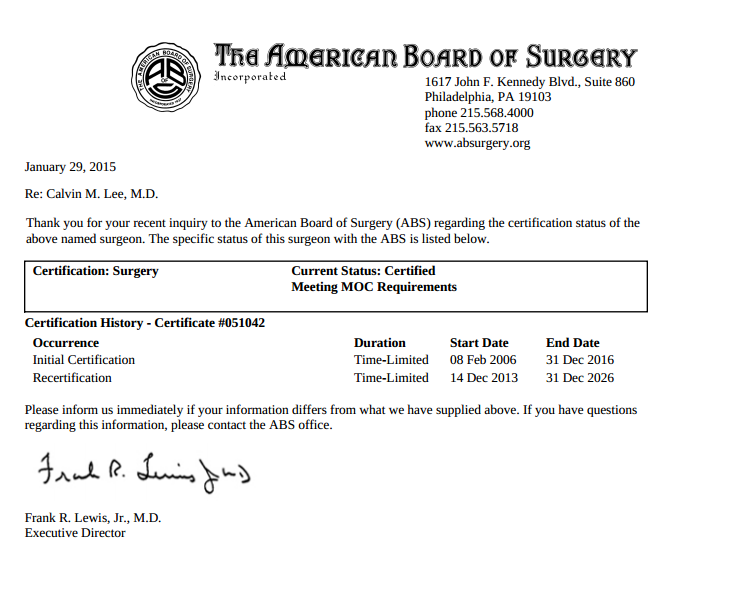 Dr. Calvin Lee is board certified in Surgery.